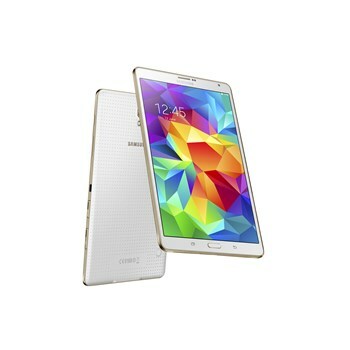 Samsung has announced the new two Galaxy Tab S tablets with 8.4 and 10.5 inche super AMOLED displays. The Galaxy Tab S will be available in selective markets from July in Titanium Bronze or Dazzling White. 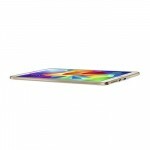 These are Samsung’s thinnest and lightest tablet to date. 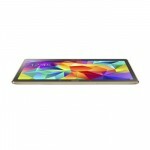 Both tablets have a sleek 6.6mm profile and weighs 465g (10.5-inch) and 294g (8.4-inch). These tablets will come with multiplicity of options : Wi-Fi, or Wi-Fi and LTE. These two tablets will be available with 3GB RAM and internal staorge of 16/32GB RAM, with the provision to extend it upto 128GB via MicroSD card. 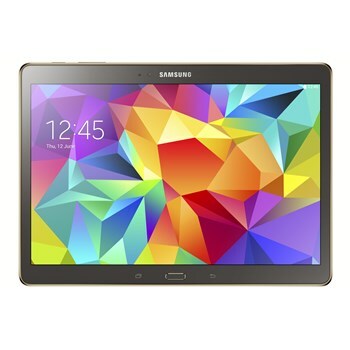 The uniue feature of Galaxy Tab S tablets is that they sport a WQXGA (2560×1600, 16:10) Super AMOLED display, which is capable of delivering more than 90% of Adobe RGB color coverage. According to Samsung this display has a remarkable 100,000:1 contrast ratio which provides deeper and more realistic images by making blacks darker and whites brighter. The Amoled displays are used by Samsung and a few other manufacturers in their smartphones. But till now, the Amoled display has not been used on tablets because larger AMOLED screens are more difficult to produce. The other feature of the AMOLED technolgy is Adaptive Display, which according to Samsung will ensures the best visual experience anywhere, anytime by intelligently adjusting gamma, saturation, and sharpness based on the application being viewed. Pre-set professional modes – AMOLED Cinema and AMOLED Photo – also let users manually adjust the display settings for bright, dynamic results for both video and photo content. Both tablets run the latest Android KitKat version 4.4 and support 4G network besides 2G and 3G. This is the reason that both the tablets have two different processor versions- the LTE supporting tablet will come with a Qualcomm Snapdragon 800 2.3 GHz quad-core processor, while the the non-LTE compliant will have will have the Exynos 5 Octa (1.9 GHz QuadCore plus 1.3 GHz Quadcore) processor. 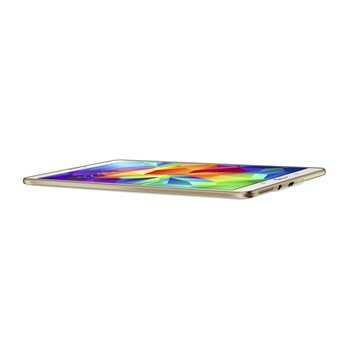 THe Galaxy Tab S tablets are equipped with 8 megapixel rear camera with flash LED and 2.1 megapixel front camera, with Full HD capabilities. 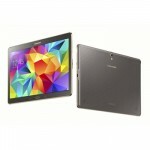 The Galaxy Tab S 8.4 is fuelled by a 4,900mAh battery whereas the 10.5 tab is packed with a 7,900mAh battery. For connectivity, both the tablets support WiFi 802.11 a/b/g/n/ac MIMO, WiFi Direct, Bluetooth4.0, IrLED besides 4G,3G and 2G. To make their newly announced Galaxy Tab S more attractive with its contents, Samsung is debutting its magazine service, “Papergarden” with which the users will be able to view a wide range of popular magazines with vivid and true-to-life colors. Samsung has also entered into partnership with Marvel and Galaxy Tab S users will be able to access over 15,000 Marvel Comics through 3 months of unlimited free membership to Marvel’s “Marvel Unlimited” app. Samsung has also made arrangements with Amazon and the Galaxy Tab S users will receive a free book every month through Samsung Book Deals, plus the access to a vast selection of e-books in the Kindle store. Galaxy Tab S users can also enjoy Netflix, available in high definition for the first time for Galaxy users in select countries. Additional useful features available on the Galaxy Tab S tablets are Call Forwarding for making and receiving calls directly from the phone to the Galaxy Tab S via SideSync 3.0; Multitasking; Quick Connect for quickly finding and connecting to nearby devices; Multi User Mode to create own personal optimized profile; Fingerprint Scanner for safe and convenient access and a specially designed ‘Kids’ Mode’ with its own dedicated interface and kid-friendly applications. Samsung has introduced the Galaxy Tab S tablets with the motive of giving tough competition to Apple’s iPad Air and iPad mini. Samsung tablets are expected to be price around $400 for the 8.4 inches and $500 for the 10.5 inches models. 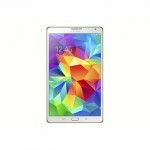 Whether, the consumers would change their preference from Apple’s iPads to Galaxy Tab S is very difficult to comment.